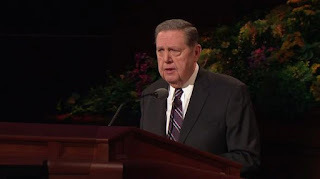 Snail Hollow Gazette: April 2013 General Conference: "Lord, I Believe"
Elder Jeffrey R. Holland of the Quorum of the Twelve Apostles delivered a conference message that addressed those who desire to believe, yet still entertain doubts. I think this generally characterizes all of us. We need admonitions such as this from Church leaders to bolster our faith. Elder Holland quoted from the New Testament the story of the man whose son had been afflicted with some nervous disorder that caused him and his family great anguish. The man implored of Jesus, "Lord, I believe. Help thou mine unbelief." The Savior, having compassion for the man and his son, healed the afflicted boy immediately. "...When those moments come and issues surface, the resolution of which is not immediately forthcoming, hold fast to what you already know and stand strong until additional knowledge comes. The second point of his counsel: When we encounter troubling times, do not begin the quest for faith by expressing how much you do not have. He says, "...That would be like trying to stuff a turkey through the beak!" "...I am not asking you to pretend to faith you do not have. I am asking you to be true to the faith you do have. Sometimes we act as if an honest declaration of doubt is a higher manifestation of moral courage than is an honest declaration of faith. It is not! ...Please don’t hyperventilate if from time to time issues arise that need to be examined, understood, and resolved. They do and they will. In this Church, what we know will always trump what we do not know. And remember, in this world, everyone is to walk by faith. ...Except in the case of His only perfect Begotten Son, imperfect people are all God has ever had to work with. That must be terribly frustrating to Him, but He deals with it. So should we. And when you see imperfection, remember that the limitation is not in the divinity of the work. As his last point, Elder Holland asserts, all of us need to ask for help at times. ...When doubt or difficulty come, do not be afraid to ask for help. If we want it as humbly and honestly as this father did, we can get it. The scriptures phrase such earnest desire as being of “real intent,” pursued “with full purpose of heart, acting no hypocrisy and no deception before God.” I testify that in response to that kind of importuning, God will send help from both sides of the veil to strengthen our belief. ...What was once a tiny seed of belief for me has grown into the tree of life, so if your faith is a little tested in this or any season, I invite you to lean on mine. I know this work is God’s very truth, and I know that only at our peril would we allow doubt or devils to sway us from its path. Hope on. Journey on. Honestly acknowledge your questions and your concerns, but first and forever fan the flame of your faith, because all things are possible to them that believe.